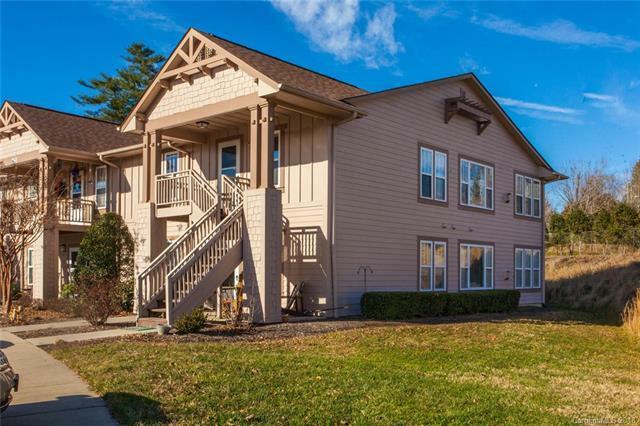 Terrific upper end unit in very popular Wolfpen! Kitchen offers space for eat in area, if desired and is open to Dining Area and Living Room with vaulted ceiling. Kitchen flooring and all carpet was replaced in August 2017. Terrific light in Living Room/Dining area with multiple windows, which also includes a lovely corner gas fireplace. Sunroom is beyond the living room, having a closet and doors that could allow this 8-window room to be a third bedroom, if desired. The back hall includes a nicely sized master suite and a very ample guest bedroom, plus hall bath and laundry area. This community is gated, has a pool, clubhouse w/fitness area, tennis courts, pitch and putt areas and walking trails. Well located for shopping, just off US 64/Chimney Rock Road and with easy access to I-26 what more could be wanted. Freshly painted and ready for new ownership! Sold by Century 21 Mountain Lifestyles/S. Hend.